Groundspeak Travel Bug [Groundspeak Travel Bug] - $4.75 : Trail Explorers Outpost, Keeping the Adventure Alive! 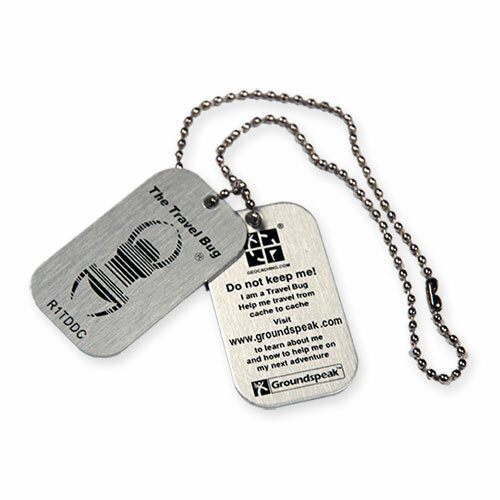 A Groundspeak Travel Bug is, simply put, a unique tracking tag that you can attach to items and give them goals for others to try and complete! Each travel bug gets its own page on geocaching.com where you can track its progress as it passes on from person to person or cache to cache. To learn more about the Groundspeak Travel Bug, visit this web site. Each Travel Bug comes as a pair; One bug gets attached to an item (or on its own) and the other is a copy that you can hold on to. Bugs have a unique tracking number stamped into the metal tag. The tag was designed for durability. Trail Explorers Price: $4.75 ea.